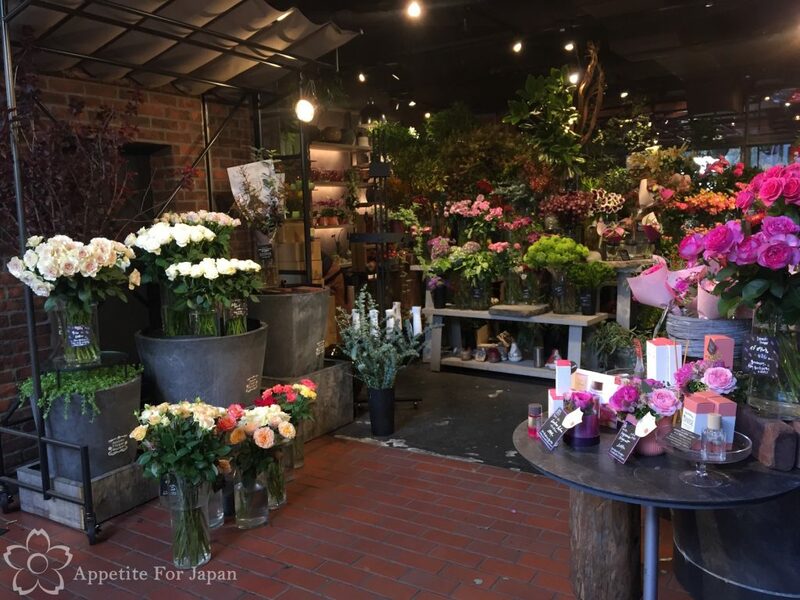 Aoyama Flower Market is a well-known flower shop with branches all over Tokyo. 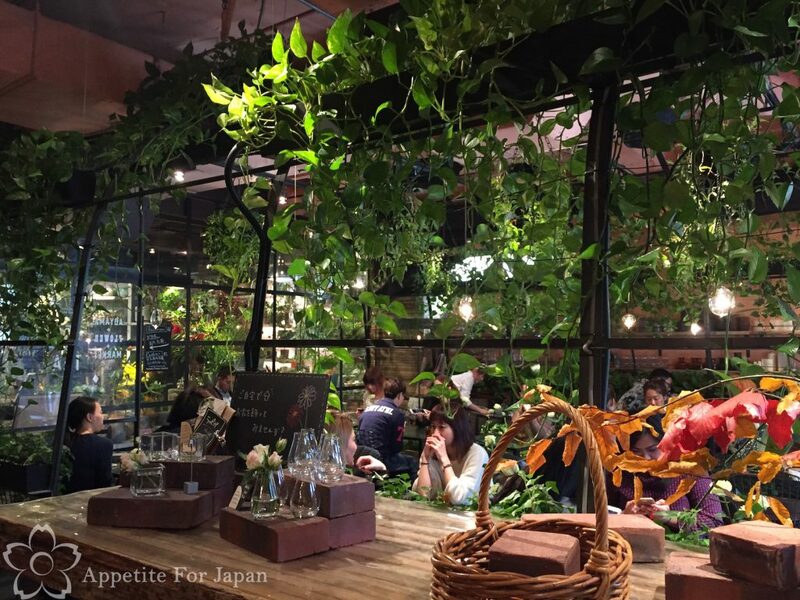 Its flagship store, located right by Omotesando Station in the area around Aoyama, Omotesando, Harajuku and Shibuya, is also home to its very own cafe, Aoyama Flower Market Tea house (sometimes known as Aoyama Flower Market Cafe). 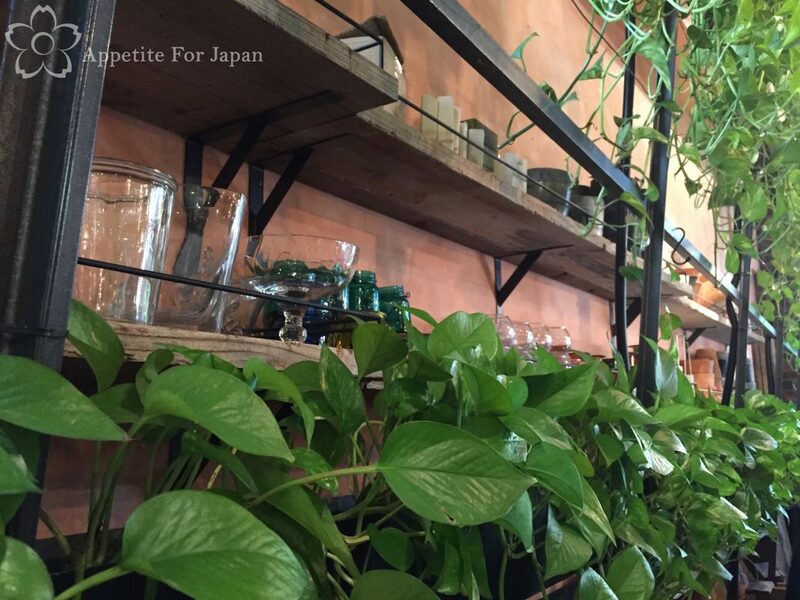 The cafe is decorated with endless fresh flowers and potted plants. 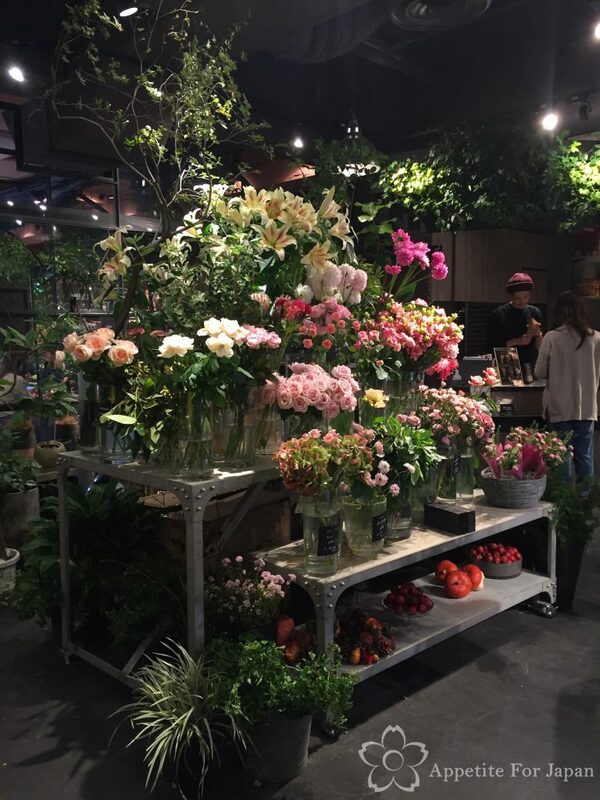 Each week, Aoyama Flower Market Tea House has a ‘weekly flower’ which they decorate the cafe with. The week that we visited, rose was the weekly flower. 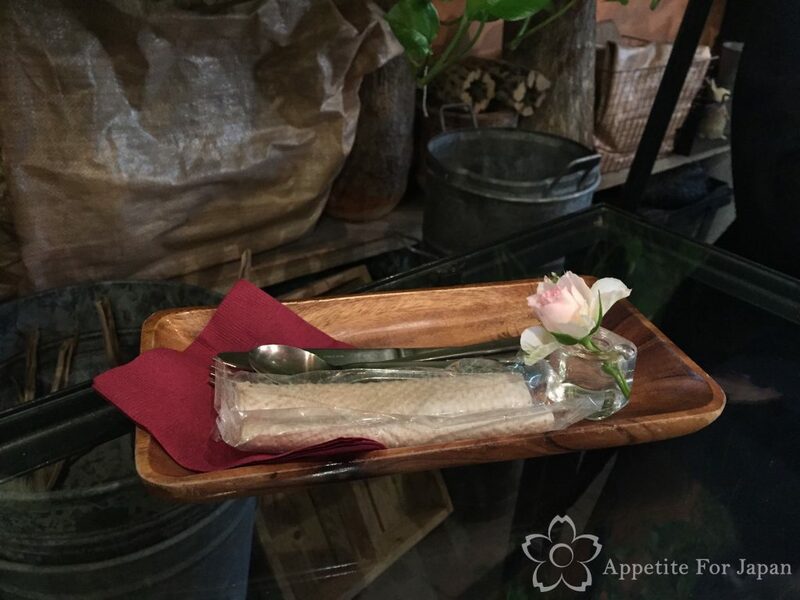 There were roses by each table, and even a little rose with the cutlery and napkin. 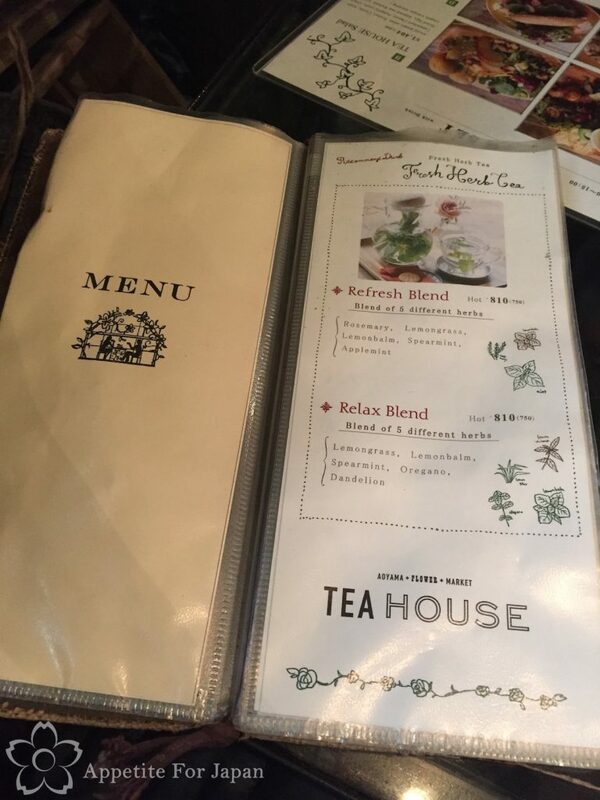 You can find the full menu on the Aoyama Flower Market Tea House here. 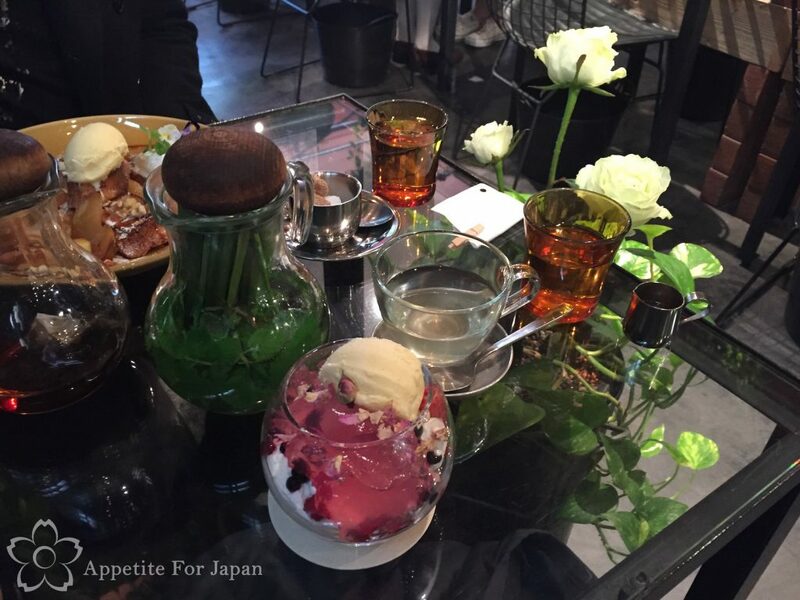 I ordered the Refresh Blend herbal tea (pictured above – it’s the green one) – 756 Yen including tax. 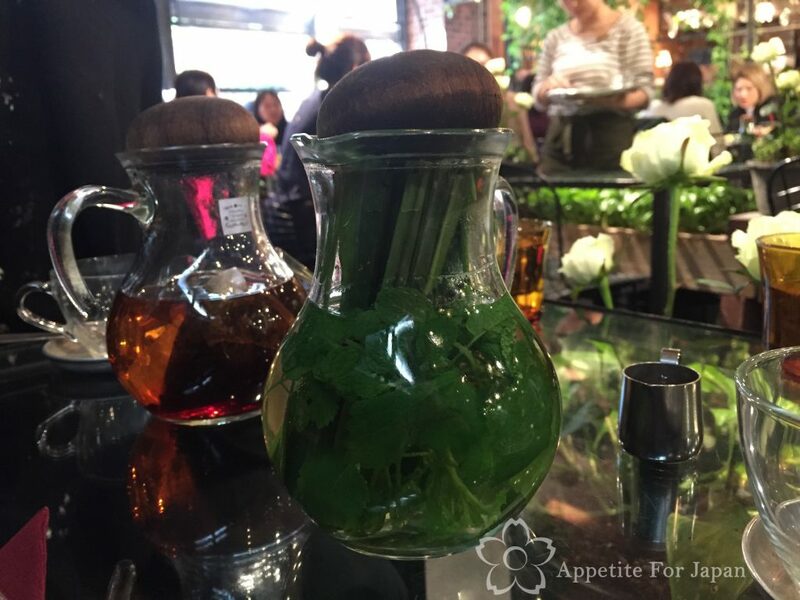 It’s a hot tea made with fresh rosemary, lemon grass, lemon balm, spearmint and applemint. It was refreshing and delicious. 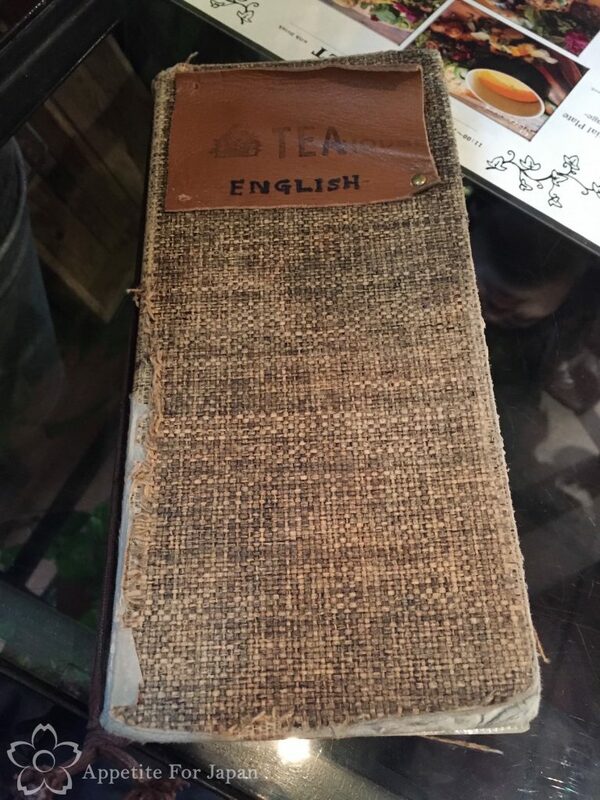 My partner ordered the Sweet Earl Gray – also 756 Yen including tax – which he really enjoyed too. 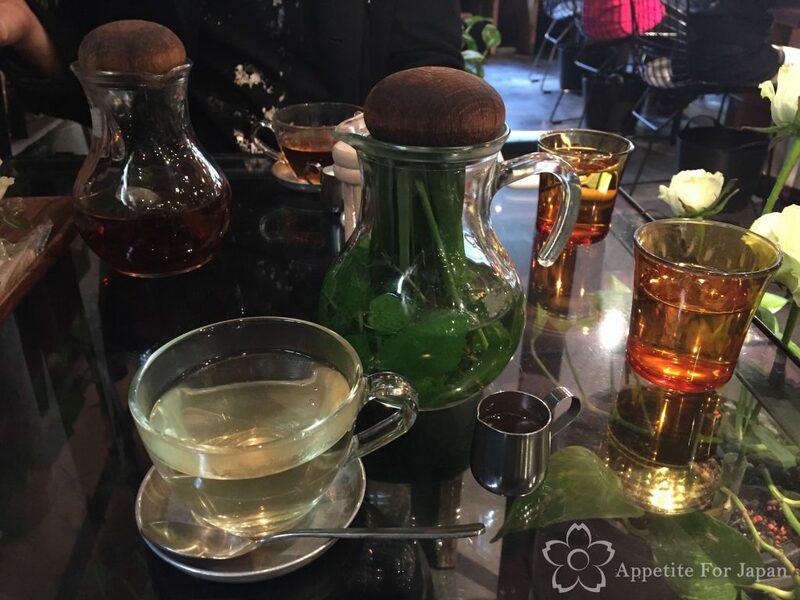 Above: Each pot of tea is enough for a few cups. As we went before lunch time, we approached this more like breakfast (if only breakfast was always this good) and went straight for the sweet food! 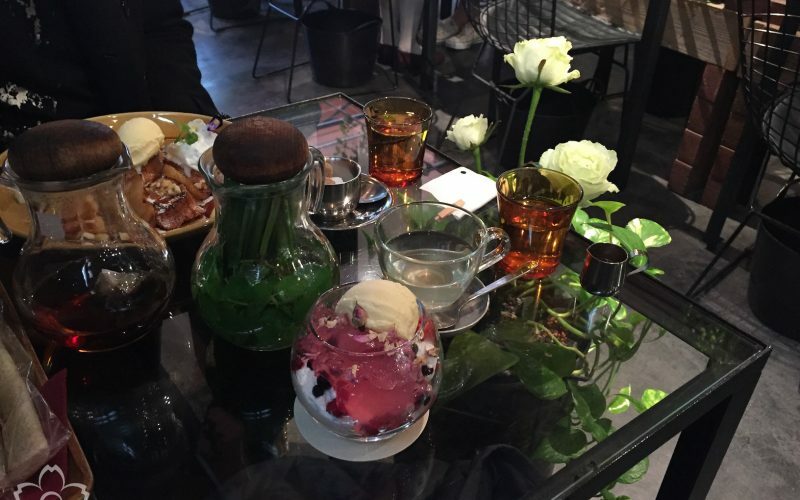 I had to order the Flower Parfait (above) because… well, just look at how beautiful it is! 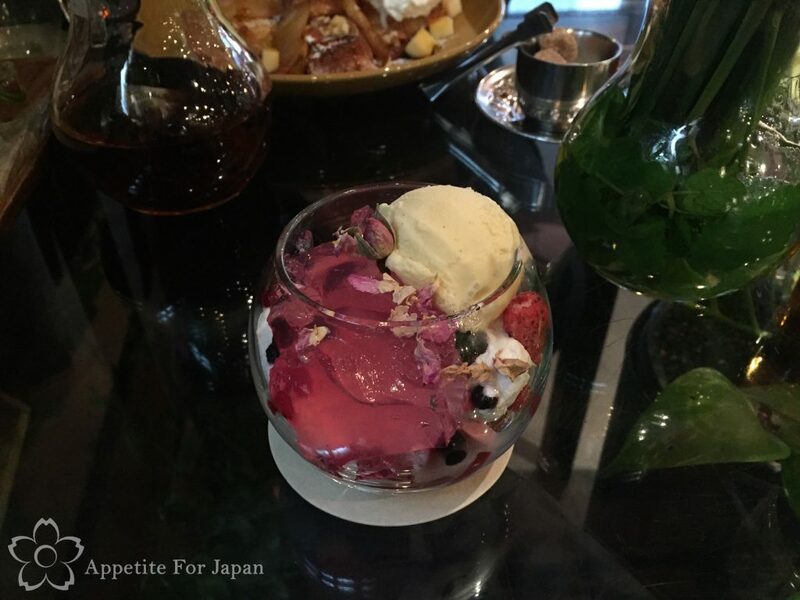 The Flower Parfait has fresh berries, rose jelly, vanilla ice-cream, freshly whipped cream and rose petals. 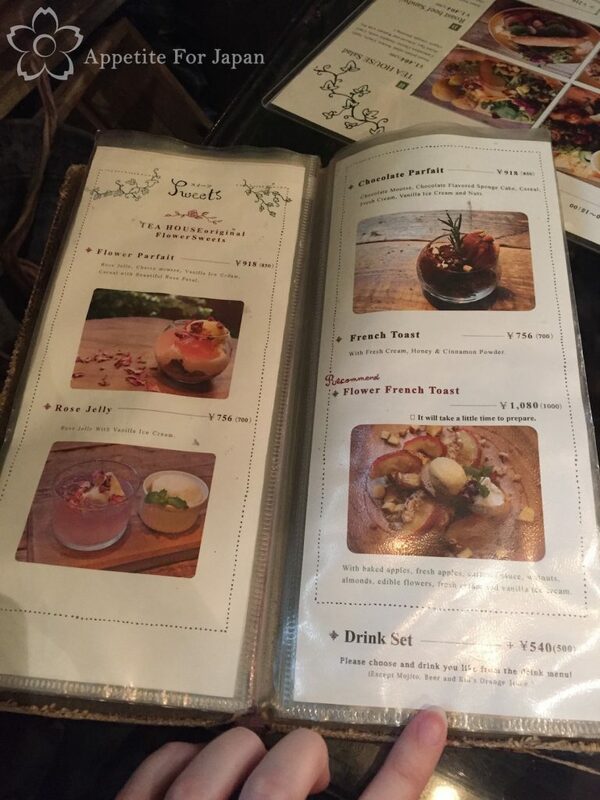 At 918 Yen (including tax), this is quite reasonable as far as really good parfaits go in Japan. If you like rose flavoured dessert, I would definitely recommend ordering this. 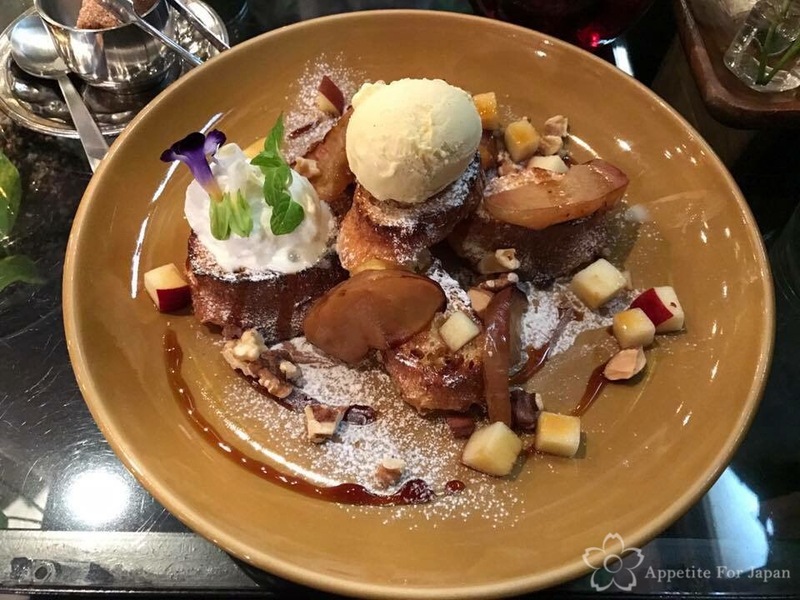 My partner ordered the Seasonal Flower French Toast, which comes with seasonal baked and fresh fruit, ice-cream and freshly whipped cream – and of course some edible flowers which double as decoration. It was 1,080 Yen including tax. He thought it was really good, and he loves French toast. On your way out, make sure you take a few minutes to look around the shop. 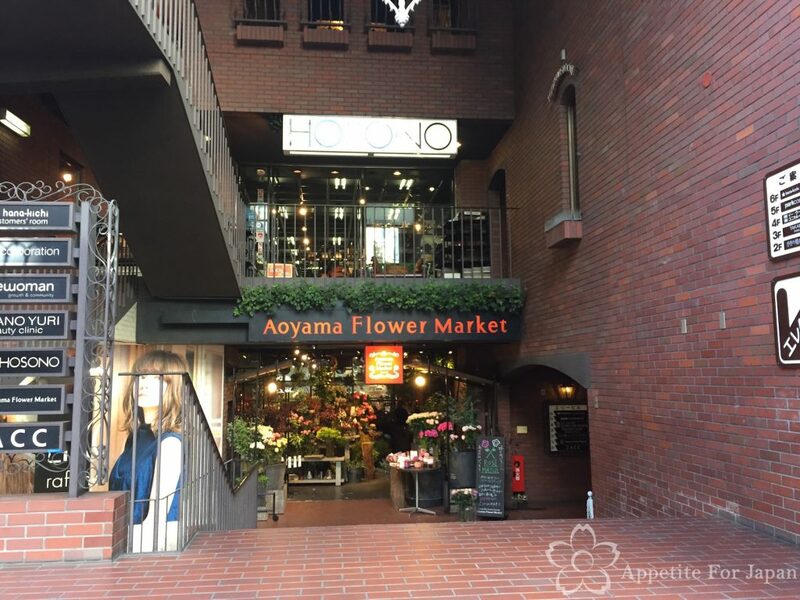 In addition to flowers, Aoyama Flower Market sells other small items like vases, decorations, and cosmetics such as rose and lavender hand creams. 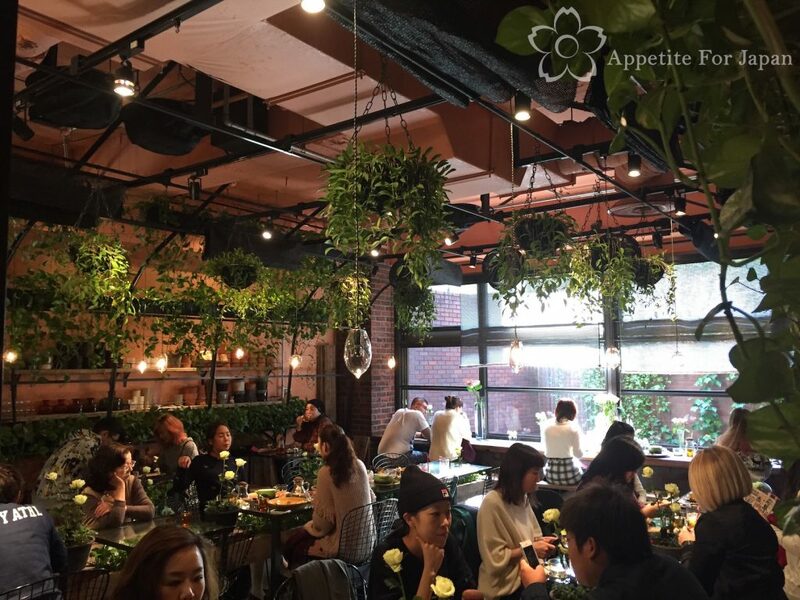 Would I recommend Aoyama Flower Market Tea House? Yes, definitely! 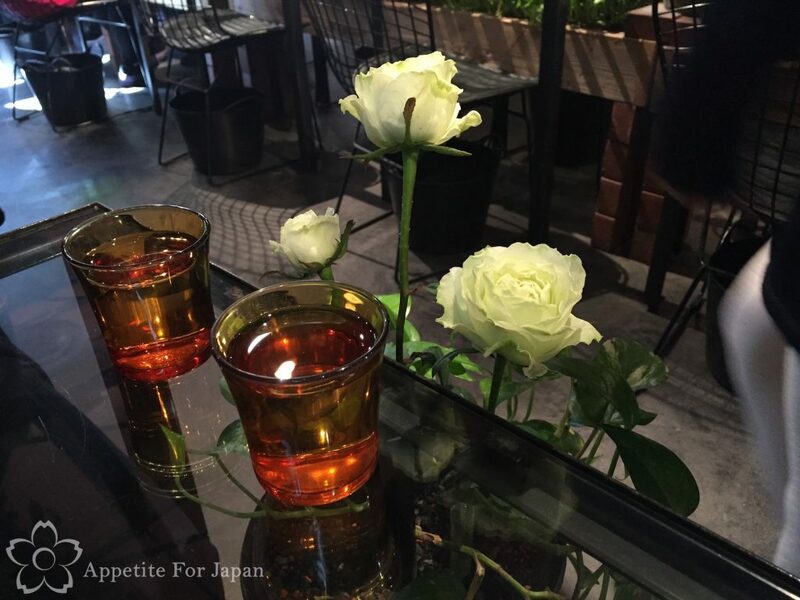 Of all the cafes that I have visited in Tokyo, Aoyama Flower Market Tea House is one of my very favourites. 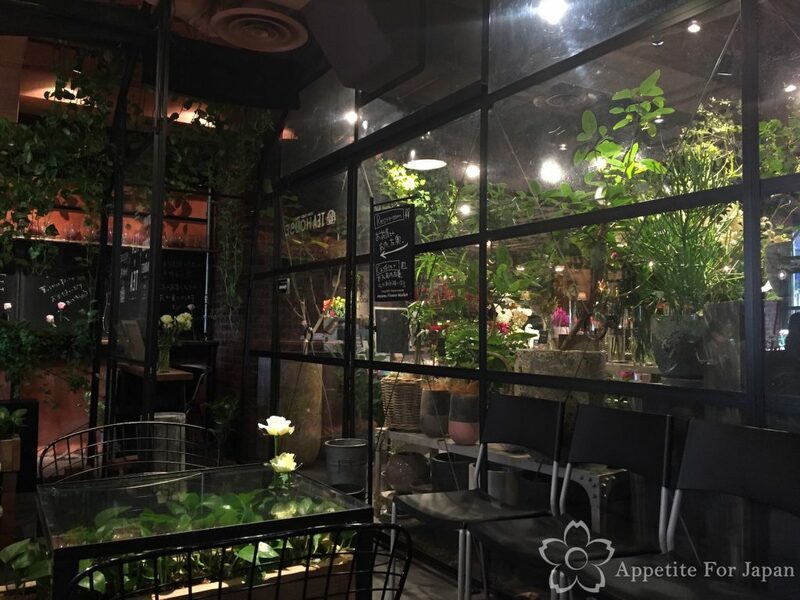 It’s absolutely gorgeous – I love plants and flowers – and the food and drinks are unique and delicious. I’ll definitely be going there again when I get the opportunity. I had heard that it get get really busy, especially on weekends. We went on a weekday before lunch time and were able to walk in and get a table straight away. By the time we had finished, it was getting busier, but we didn’t encounter the queues out to the street that we’d read about. 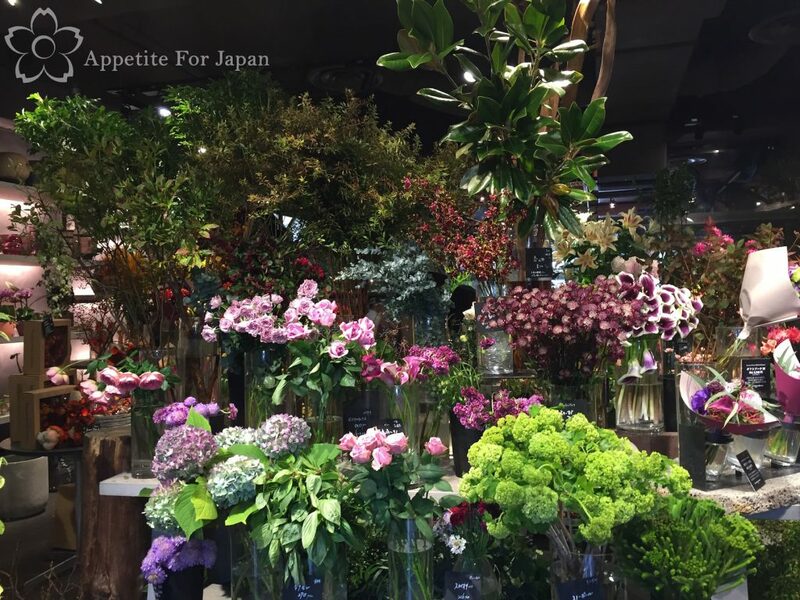 Make your way through the florist store (Aoyama Flower Market), and the cafe is through the door at the back. It’s that easy!